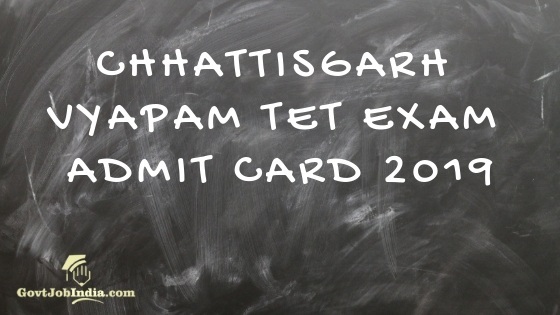 CG TET 2019 Admit Card: Candidates who are appearing for the CG TET Exam can download their CG Vyapam TET Admit Card 2019 from the link below. The hall ticket is set to be released about 1 week before the exam date. As of now the CG TET Call Letter 2019 has not been released. Candidates are requested that they keep an eye on this page for the latest news and updates regarding the CG TET Admit Card 2019. We will display the CG Vyapam Primary Teacher Qualifying Exam Admit Card on this page as soon as it is revealed by the CGPEB. 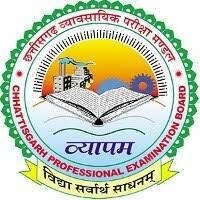 The CG TET exam is a yearly exam conducted by the Chhattisgarh Professional Exam Board. The purpose of the exam is to ensure that individuals who are applying for teaching jobs in the state of Chhattisgarh be made to go through a standards check. This makes sure that only the best candidates are eligible to apply for Primary school teaching jobs. The Chhattisgarh TET 2019 will feature 2 exams. CG TET First Paper is for candidates who want to apply for Primary teaching roles in Classes 1-5. The CG TET Second Paper is exclusively for those candidates who want to apply for upper primary teaching jobs for classes 6-8. Candidates are notified that the CGPEB has not yet released the CG TET Admit Card 2019. You can download the CG Vyapam Admit card 1 week before the exam date. Since the exam date is on 24th February, candidates should probably be able to download their TET Admit Card between the second and third week of February. We would like to notify you that we have provided a link at the bottom of this page from where you can download your Exam Admit Card as soon it is released by the CGPEB. The link will be active as soon as the Admit Card is released. CG TET 2019 will be conducted on the 24th of February 2019. The exam is set to be conducted throughout the state of Chhattisgarh across a number of centres. The complete list of CG TET Exam Centers and Center codes are enlisted in the table below. More details regarding the CG TET Exam are available on our dedicated page for the same. This is regarding the CG Vyapam TET 2019 Exam Pattern and Syllabus. Make sure to visit that page for more in-depth details regarding the exam scheme and curriculum. How to download CG TET Exam Admit Card 2019? The first step is to visit the official website of the CG Vyapam @cgvyapam.choice.gov.in. Once on the website, you will find the homepage is full of the latest updates. Within this list, you will find the CG TET Admit Card 2019 link. Keep in mind that the link will only be available if the CG Vyapam has released the CG TET Admit Card 2019. Once you click on the admit card link a new window will open wherein you will have to enter your 15 digit registration id and password. Don’t forget to check this page occasionally for all the latest news and updates regarding the CG TET Admit Card 2019. We hope you are preparing well for your CG TET Exam 2019. All the best and feel free to address any doubts in the comment section below. We will do our best to help you with your doubts.